FOR IMMEDIATE RELEASE: Lewiston, Maine (June 29, 2016) – They are two of the top light-heavyweights currently competing in New England Fights (NEF). Their respective most recent wins were both against Jesse Baughman (0-2). Both are accomplished wrestlers. At some point, Mike “The Mustache” Hansen (4-4) and Matt “The Beast From the North” Andrikut (2-0) were bound to collide. That collision will take place at “NEF 25: HEROES & VILLAINS” on September 10, 2016 in Lewiston. 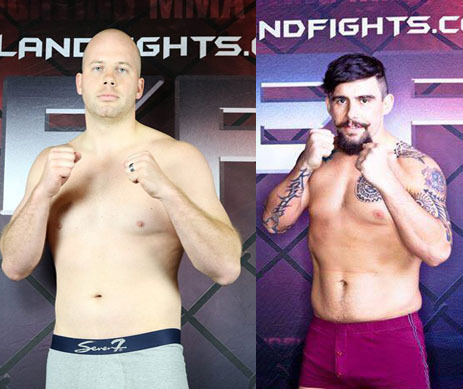 The mixed-martial-arts (MMA) contest is set at a fight weight of 205-pounds. Hansen is the founder of the Berserkers MMA fight team based out of the Greater Rumford Community Center in Rumford, Maine. He was a Maine state champion wrestling out of Mountain Valley High School. Hansen dropped his last fight to Brendan Battles (1-0) at “NEF 23” in Hyannis, Massachusetts. He had a chance to avenge that loss and get back on the winning track this month at “NEF 24,” but suffered a setback when his opponent fell out the morning of weigh-ins. Prior to his professional MMA career, Matt Andrikut wrestled for the University of Southern Maine (USM) and also boxed as an amateur. He was a finalist in the Northern New England Golden Gloves. During his amateur MMA career, Andrikut famously defeated Pat Walsh. Walsh would later go on to compete in the UFC and World Series of Fighting at the national level. Andrikut is 2-0 in the NEF MMA cage since debuting with the promotion last year.